Have you ever been in a situation where you have liked a dish served at a restaurant so much that it got so etched in your memory, compelling you to recreate a similar one by yourself? Though it has happened to me few times the one that I recall very well is Paneer Mushroom Masala served at a vegetarian restaurant in Pune, India. If you have read my previous posts you would be knowing my craze for non-veg dishes and how much I preferred having non veg dishes rather than veg dishes. But this particular dish completely caught me off guard and I found myself going to the restaurant ever since, for the sole reason of having their Paneer Mushroom Masala. After few futile attempts at recreating the dish, ever since I started cooking, I should say that this one came very close! After all, it was the proper ratio and combo of ingredients that mattered and I learnt it the hard way. The blend of freshly powdered spices with sauteed ground onion-tomato-cashew mixture gives a lot of flavour to this creamy rich gravy. As in other dishes, I have made this with my choice of ingredients. I love the taste of golden stir fried paneer in my dishes and the flavour imparted by green bell pepper. The use of butter instead of oil gives a rich taste to the dish but since I wanted to cut down on butter, I used it only for stir frying paneer. This dish goes well with Chapati/Roti/Naan. Dry roast the ingredients mentioned above on medium heat until the colour slightly changes and you get the aroma of roasted spices. Cool and grind well. Keep aside. Grease the cooking pan with enough butter over high heat(gas 8) and stir fry paneer until golden brown. Keep aside. Heat oil/butter in the same pan and saute onions till brown. Add ginger garlic paste and saute till raw smell goes. Cool and grind to a paste. Keep aside. Grind cashews and poppy seeds to a paste adding enough water. Heat oil in the cooking pan and saute bay leaves for some time. Add the onion paste and ground spices kept aside before. Saute for few seconds. Add tomato puree and mushrooms and continue cooking till mushrooms are cooked well. When the mushrooms are half cooked add the chopped green pepper. Add chilly powder, turmeric powder, cumin powder, coriander powder, garam masala, enough salt and saute till raw smell of spices go. Add crushed kasoori methi. Mix well. Add cashew-poppy seeds paste along with milk and enough water. Reduce heat to low and add fried paneer pieces. Cook for few minutes with closed lid. Open the lid and add ketchup and mix well. Garnish with cilantro and remove from heat. 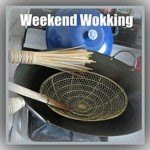 This goes to Weekend Wokking:Cheese hosted by Yasmeen of Health Nut and started by Wandering Chopsticks. Fantastic, looks very professional(restaurant quality). I was in search of some mushroom recipes,will try this for sure..looks tasty,both my fav ingredients.. Ouch..This has left me craving for Paneer right now..! I need to add this to my list of new things I love. OH MY! Mushrooms and paneer! I am trying this for sure. Thanks so much for this post! wow! fentastic ..Looking soo yummy! Hey Pooja,Even I posted a paneer dish for my 25th post. Your dish looks so creamy and tasty.Nice click.Thanks for sharing. Thanks Gita :) I love that combo too! Thanks Vrinda :) Do try it. You would love this! Thanks a lot Shabs :) Glad that you liked it. Do try it sometime. You will like these! DB, you would love this for sure! Thanks Lisa :) Do try it dear! Thanks Pari :) I will check out your version too! Thanks Aysha :) Yes this forms a nice combo! This is a superb combo!looks great! what a creamy n yummy masala...looks really yummy.. Thanks Parita :) My favourite combo! Thanks Prathibha :) The blended onions,tomato puree and cashew paste gives enough creamy texture so that you neednt add cream! Looks yummy... Actually to get the exact taste, get the recipe from an expert chef website like sanjeev kapoor or tarla dalal. They might suggest a few secret ingredients to enhance the taste to restaurant quality!! hey,btw i tried to open your blog with windows explorer several times and it failed..now this is firefox..whats the prob ? please check..some of the sites have this prob. OH dear! this looks awesome. I would love to have it with Rotis. Poojs lovely pics ... looks tempting !! Ur blog looks xxlnt dear! U are doing a great job pooja. Thanks Lissie :) Yes I like that combo! Thanks Sangi for dropping by :) You have a great blog too! Looks flavorful with all those aromatic spices in there. Thanks Divya :) Yes it adds a lot of flavour! looks awesome dear... delicious and tempting clicks!!! I haven't tried mushroom-paneer combination so far. ilove anything with Paneer and this dish looks sooooo tempting, nice combination Pooja! Thanks Aruna :) I'm paneer crazy too! Thanks Preety :) Frankly Malai Kofta was my project too. Happened to recreate it to my satisfaction. Will post that soon! Hey pooja thats really fantabulous dish i too love this combo of paneer and mushroom,,, wish to taste urs with naan.. Thanks Pavithra :) Its a nice combo and goes well with Naan. Do try it sometime! Bumped in to this blog while searching for recipe with few main ingredients at hand. Followed recipe and it did turn out to be quite good. Thank you. I loved the recipe so much and made it on Valentine's Day. It turned out excellent. My wife and kids loved it so much. Thanks for going thru all the trial & errors to perfect this recipe. The next time, I'll reduce the ginger garlic paste to 1 tbsp and see how it'll come out. Thanks for making our Valentine's Day dinner a special one. I felt very proud.